Titan Comics is adding another Games Workshop tabletop game to its comic book roster—and this one is somehow even weirder and crazier than even the grim dark future of their Warhammer 40,000 comics. Yes, brutal world of (extremely) fantasy contact sports that is Blood Bowl is getting its own comic series. For those unaware, Blood Bowl is a spinoff board game of Games Workshop’s Warhammer Fantasy Battles universe, and despite being a British company, it’s not a fantasy take on European football—or soccer, as you folks over in the U.S. know it—but a pastiche of American Football. It is, essentially, the same sort of sport but with Warhammer fantasy races like Wood Elves and Orcs playing against each other... and often killing the crap out of each other in the process. Even though it was first released back in 1986, it’s since gone on to be one of Games Workshop’s most popular games, even spawning several video game iterations in the process. Written by Nick Kyme and with art by Jack Jadson, Blood Bowl: More Guts, More Glory will follow a team from the Human Empire, the Hochland Harbingers, who attempt to rise to fame (and survive encounters with some of the roughest races in Warhammer) in the Blood Bowl League by recruiting a washed out former Blood Bowl star, the amazingly named Dreng Sturmblud. Check out some of the interior art and a few covers for Blood Bowl #1 below, making their debut right here on io9. 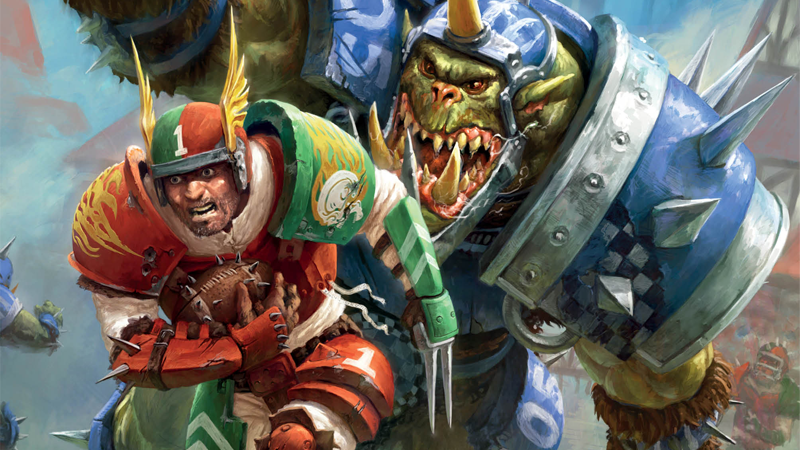 Blood Bowl: More Guts, More Glory #1 will hit comic shelves in the U.S. and the U.K. May 10.